What birds might use nest boxes? Western Bluebird, Tree and Violet-green Swallow, Titmouse, Ash-throated Flycatcher, White-breasted Nuthatch, Chickadees, Woodpeckers, and Wrens. 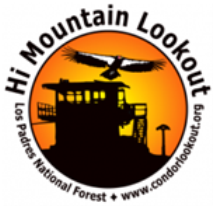 Or larger birds such as: American Kestrel, Northern Flicker, and possibly Screech Owl. Why put up a nest box? Many birds have lost their natural habitat due to degradation (development, grazing, tree clearing, farming, pollution). Without appropriate habitat, birds don't reproduce. This is where we can help. Where there's a shortage of natural habitat some birds will use nest boxes. These boxes also provide night time safety, and shelter from inclement weather. What is a functional nest box? Birds who use cavities don't need a perch under the entrance hole. A perch actually assists predators, who may grab a chick out of its nest. The size of the entrance and the interior depth of the box are important. The hole should be 1½ inches in diameter (1 9/16" is typically suggested for Western Bluebirds) - too small for Starlings. The inside of the box should be scored below the hole, so chicks have a rough surface to hold onto (scrape it with a screwdriver). Bird boxes with less than 6 inches of space below the hole don't allow enough space for nesting material (except for Wrens). The eggs/chicks will be too close to the hole, easy prey for predators. The wood should be at least ½ inch thick for insulation (please don't use plastic boxes) and have ventilation holes. Boxes should be easy to clean out at the end of nesting season. Where should I put a nest box? Nest boxes should be placed at least 5 feet above the ground, in a tree or on a pole. You can add height above a fence by securing a pole to the fence or fence post. Nest boxes should not be placed where predators (cats, raccoons, opossums, etc.) can easily get at them. NEVER set a nest box on a horizontal branch or fence railing – a predator can walk right up and reach in, or easily pounce on a busy, distracted bird. It's best for fledglings to have a safe place to fly to, such as a tree, so they don't end up on the ground. When is the best time to put up a nest box? 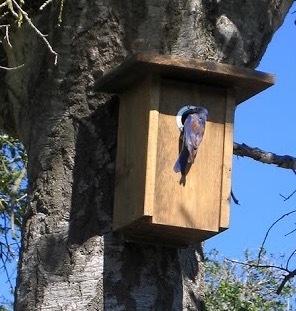 Nest boxes can be placed at any time of the year. The nesting season is typically February through July, so one bird species may use your box in February, another species may use it in April, May, or June and it may also be used to roost in during the rest of the year.